Originally I was going to have Camp Blisshaven be a craft camp where kids would make knicknacks and. tchotchkes and other hard-to-spell-things. But I changed it at the 10th hour, which is 60 minutes before the 11th hour, which is when most such important decisions are made. Please note the small injoke that I got a little wrong; the comedy & tragedy masks are based on the Andrews & McMeel logo. The goofier GoComics logo would've been more appropriate. Theater camp was such an obvious and inevitable choice for Camp Blisshaven, not only for the ripe opportunity for small-kid comedy that it offers, but also for more sentimental reasons. My wife Amy has worked in theater with kids for quite a few years, starting with my daughters' elementary school, which has a Shakespeare program for fifth graders. The kids spend half the school year working on a Shakespeare play, sometimes a comedy, sometimes a tragedy. It's a cut-down half-hour version with multiple casting, several to a part in the big rolls. The first time we saw a production, when my older daughter was in kindergarten, they did Romeo & Juliet. We didn't know quite what to expect. A few minutes into the play I was almost suffocating with laughter, and some other emotion that I'm not sure what to call; awed delight, maybe, that peaked during Mercutio's death scene ("A plague on both your houses") after a hugely energetic sword fight. When I was in school we didn't touch Shakespeare till 9th grade, when we read Richard III in English class and looked confused. But these fifth graders were giving a passionate, lively performance, made irresistibly funny by the fact that they were fifth graders. Also, all of the Juliets were about a foot taller than all the Romeos. It always takes me a few minutes or longer to get into the rhythm of a Shakespeare play, but I remember picking up on this Romeo & Juliet right away. Maybe the brevity of the production helped. Anyway, Amy started volunteering to help run the production a few years later and got pretty intensively involved. One of the more glamorous skills offered in the program is stage combat, taught by a professional stage combat artist, where the kids learn how to fall, swordplay, do fake hairpulls and other vital life skills. There's even a production stuntman, a kid-size doll Amy made that gets tossed around and man-handled, and spends its offstage life on a chair in our living room. In the last 3 or 4 years Amy's been working at various after-school and summer theater camps too, and my older daughter's first summer job was assisting at one of them. Surrounded as I am by theater folk, it's inevitable that some of it leaks into the strip. And I didn't even mention that my brother has been the master sound designer at Arena Stage in DC for almost 20 years. I've done a few Alice-in-the-shrub cartoons and each time I think they'll be easy to draw. Alice sitting amid a mass of leaves, what's difficult about that? But somehow each time I end up getting into the leaf-scribbling a little too intensely and I have to back off and use white to loosen things up and undensify the texture. Next time I'll either use a fatter nib or stand three feet away. 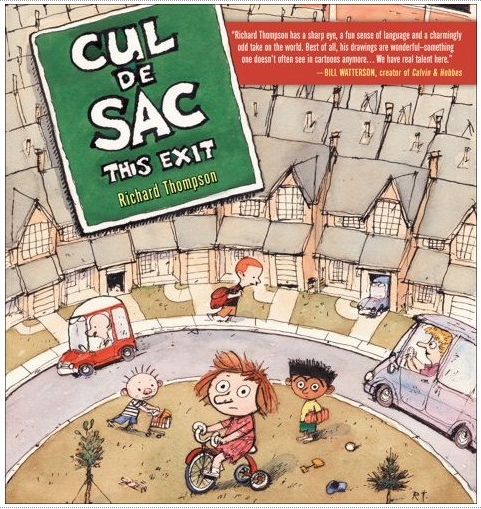 Stuff for Sale at Team Cul de Sac! This is our limited edition Portfolio 11" x 13.06" print. Signed by Richard Thompson and numbered by the one and only Mike Rhode. This is limited to 25 prints. All proceeds (including any extra shipping charges) will go to Team Cul de Sac. We will be picking prints at random as they are ordered. The prints are $50.00 each and $15.00 shipping. I ( Chris Sparks) will also be more than happy to sign the prints. Above is the Richard Thompson-drawn cover to FAVORITES, a home-grown zine where notable comics critics, artists and bloggers write their individual answers to a single question: “What is my favorite comic, and why?” For an excerpt, see here. The contributors are an all-star line-up: Derik Badman, Noah Berlatsky, Alex Boney, David Bordwell, Matthew J. Brady, Scott Bukatman, Johanna Draper Carlson, Isaac Cates, Rob Clough, Corey Creekmur, Andrew Farago, Shaenon Garrity, Dustin Harbin, Charles Hatfield, Jeet Heer, Gene Kannenberg Jr., Abhay Khosla, Susan Kirtley, Sean Kleefeld, Costa Koutsoutis, Andrew Mansell, Robert Stanley Martin, Chris Mautner, Joe McCulloch, Ana Merino, Mike Rhode, Jim Rugg, Frank Santoro, Chris Schweizer, Caroline Small, Tom Spurgeon, Ben Towle and Matthias Wivel. FAVORITES is 40 pages long, and can be ordered via the PayPal button below. The cost is $5.00 plus $1.25 shipping and handling. (All the money that isn’t spent on envelopes and postage will go to Team Cul de Sac, and research into a cure for Parkinson’s disease.) Thank you for your support! I hope you don't think this place is turning into some kinda rag and bone shop, pushing books (that Amazon sale is still on!) and art and such. We offer only the most select rags and bones. and all for a good cause. Namely, to bring high-quality cartoon entertainment to you, the discerning consumer of high-quality cartoon entertainment! I'd forgotten all about this Sunday strip. Not because I did it so long ago; it was probably drawn only a matter of hours ago. But I did get a nice surprise when it showed up, which doesn't often happen. Usually it's more a feeling of weary recognition, like, oh, you're that one, I'd forgotten about you, you used to be funny, when did you get so worn-out looking. This one I like just fine. It's simple enough that I could draw it half-asleep, and probably did. But it's got enough complexity to hold its own and opens the door for further elaboration in future strips. 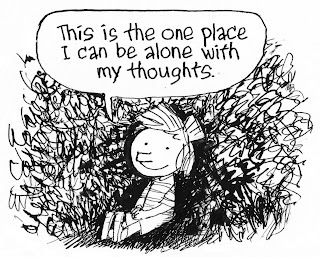 And further elaboration is something that anyone who draws a cartoon every day is always on the lookout for. 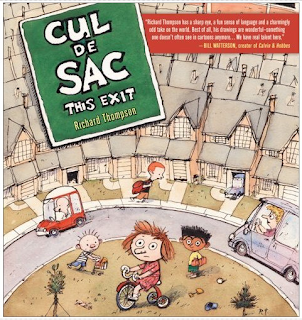 And now the first Cul de Sac book is only $5.07 on Amazon! Is 507 a prime number? Who picks these prices anyway? 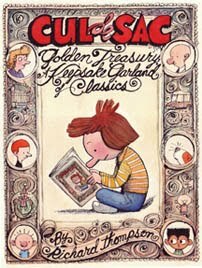 Cul de Sac Golden Treasury a Garland of Classics is only $6.80 on Amazon! Wowee, somebody's losing money on this crazy sale! and it can be a bugger to get all five nibs firing simultaneously. Usually getting just one to behave is all I ask. And while there's time, here's today's strip. Hey, look at that crosshatching, huh? Somebody must have time on his hands to monkey around with that stuff. Though it looks like he hasn't had a new idea in two years. 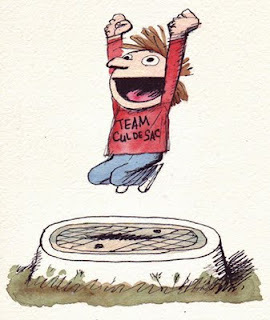 Quick, while it's still the Fourth of July, here's an old Cul de Sac from July 2, 2006. 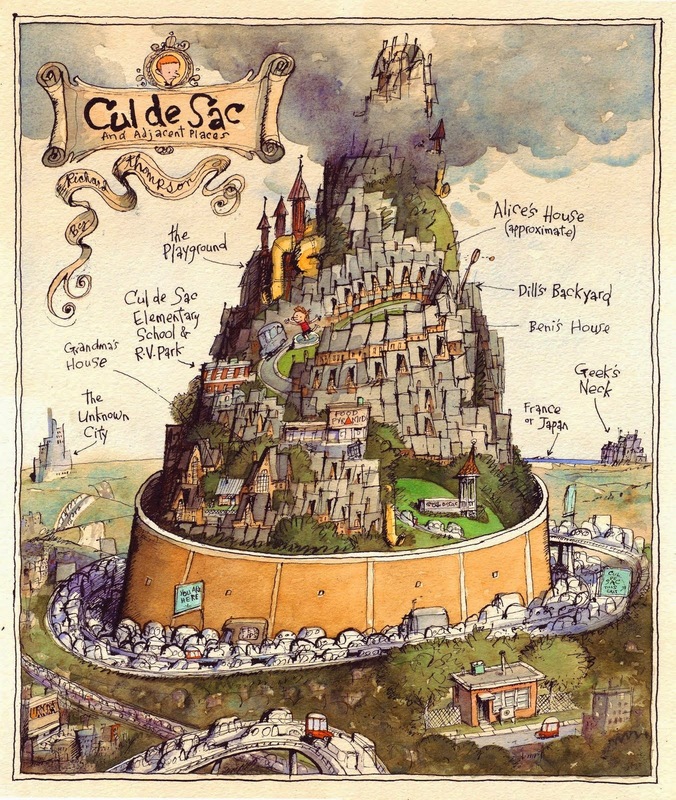 We seem to have lost track of what's going on for the last month or two (and this isn't even today's Cul de Sac). 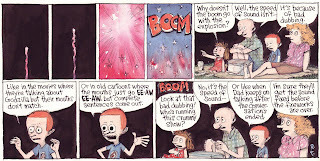 Let's partially rectify this by cramming a week's-plus of daily strips into one belated post. I've got to admit that when I drew this I wasn't too sure what would happen next, or how it would end. When in doubt on this strip, it usually helps to add Dill. But here Dill is not of much help. In fact, he's no help whatsoever. Though his demented wasp bit was fun to draw. it's always good to drop in a little showstopper like this during the week. And lets throw in some more characters. So she's ready to be impressed. And Dill's not ready for anything. 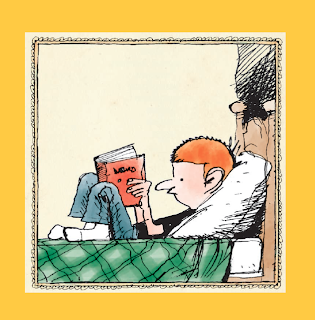 I gave a talk at Heroescon in early June and I mentioned something I figured out about Petey, Andre and Loris during their cartoon camp last summer. 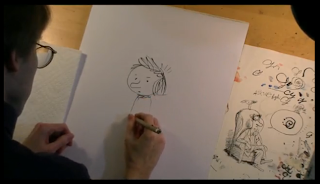 Petey's a comic by Chris Ware, Andre's a comic by Jack Kirby and Loris is manga. I had a hard time here not expanding on Andre's warning, like "Great will be my wrath! So says Andre!" and stuff like that. Fortunately I ran out of room. And Petey comes to a conclusion just in time to miss the whole epic adventure.